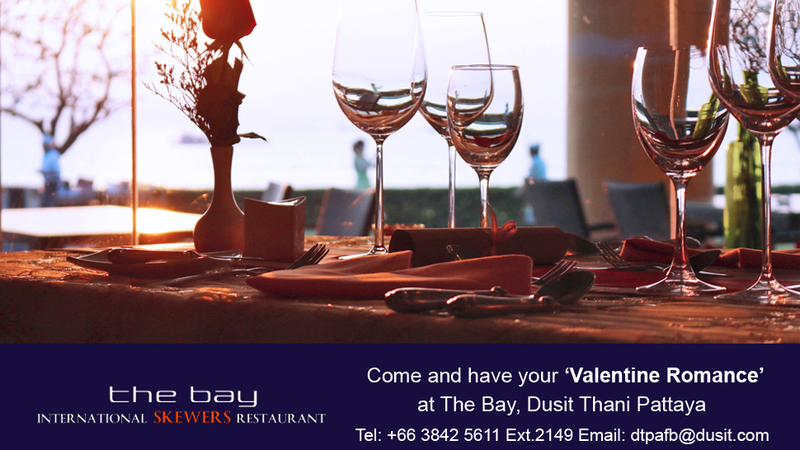 On 14 February, spend an intimate journey through the sea-of-love at Dusit Thani Pattaya this Valentine’s Day. Enjoy a perfect, romantic evening and pamper yourself and your loved one with “Valentine Romance Set Dinner”, exquisitely prepared by our Chef at The Bay International Skewers Restaurant, affording splendid night views of Pattaya Bay. Valentine Romance Set Dinner for just THB 3,299++ per couple inclusive of a complimentary glass of wine or sparkling wine and rose for couple.